Previously (see ALDI Steel Cut Oats), was mentioned the benefit of the relatively high level of soluble fiber found in oats. That benefit is simply the sponge-like effect soluble fiber has on cholesterol which helps lower how much goes from other foods into your blood during digestion. That’s usually a good thing for people who are trying to control cholesterol. There’s nothing wrong with the ALDI oats. But they take from 25 to 30 minutes to cook. 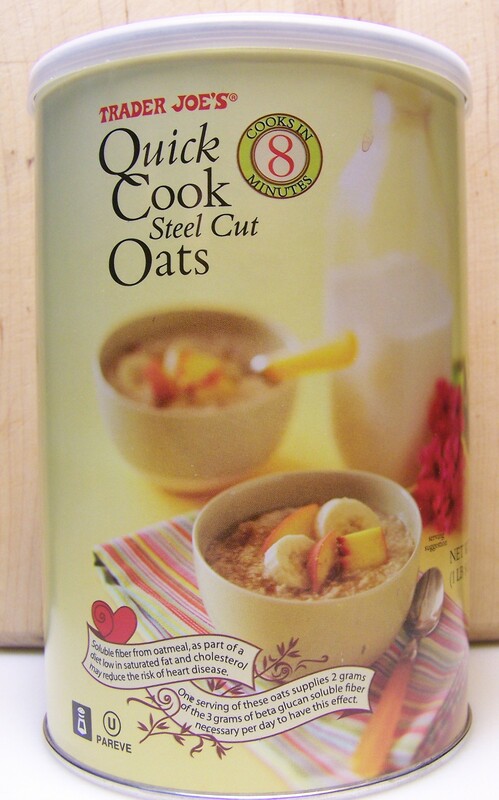 These oats from TJ’s are “quick cook” (it’s right in the name of the product) and take only 8 minutes to cook. When you’re in a hurry, a few minutes saved can be important. And they have the same 2 grams of soluble fiber per 1/4 cup uncooked oats as the ALDI longer cook oats. 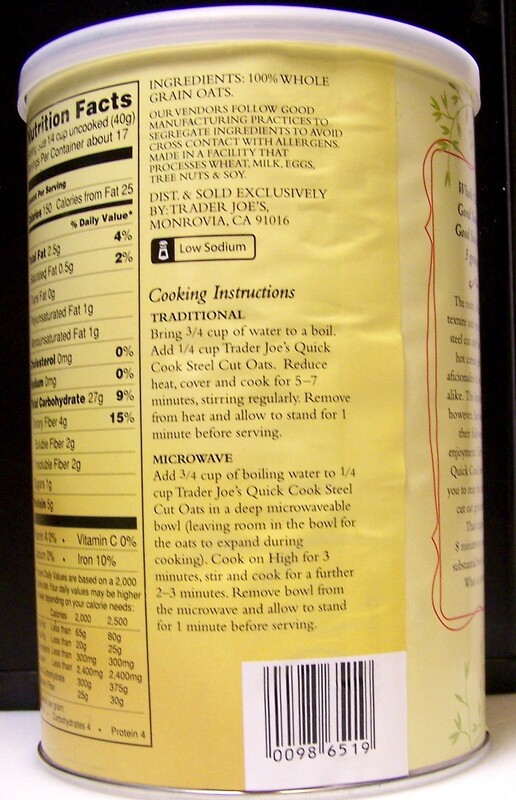 So you ask, “How can they cook faster?” TJ doesn’t print the secret on the label, but just from eyeballing it, TJ’s oats are cut into smaller pieces. Smaller pieces have a greater surface area per weight and allow the heat to reach the center of the food faster (cook). That’s a great sounding theory. I hope it’s close to the truth. TJ’s directions also cook the oats with the pot covered. That may make the cooking faster, and it requires less water to cook (about 1/2 less). The only disadvantage to covering the pot is that the oats tend to “boil over” easily if the water gets boiling more than a simmer. All in all, whatever TJ does, the oats cook in the claimed 8 minutes and are very comparable in texture and taste to the ALDI steel cut oats. As for price, they’re the same as the ALDI longer cooking oats, $2.49. 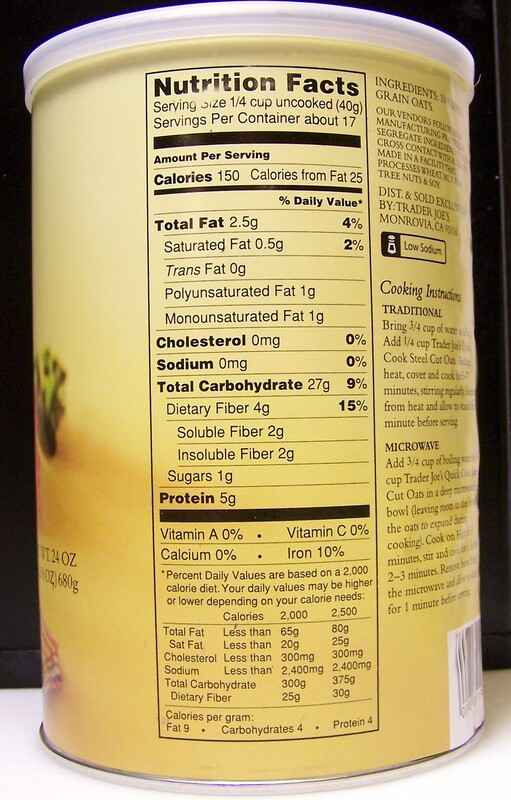 But the TJ can is smaller having three fewer servings (17) per container. There’s the trade-off, 3 fewer servings for 323 fewer minutes of total cooking time per container. With a cost per serving of 15 cents, it’s still an economical food. This entry was posted on 04/12/2012 at 08:11 and is filed under Recipes, food, cooking and related items, Trader Joe's. You can follow any responses to this entry through the RSS 2.0 feed. You can leave a response, or trackback from your own site.